Not the uniformly biggest hailstones I've experienced, but certainly the most powerfully driven and longest hailstorm I've been through. Most of the stones were about half-dollar size at the peak, but the dents in my roof vents tell me we had a few that were at least as big as baseballs. Looks like I get a new roof and landscaping out of this deal...... less the deductible. Oh well, the wife's roses WERE lovely and WERE going to be spectacular. KC-45 Tanker Protest: Why So Warlike? Scott Hamilton, of Leeham Co LLC, offers some interesting theories as to exactly why Boeing is using a "scorched earth" policy in pursuing a very public protest against the KC-45 contract award. At first glance, I find most of them somewhat appealing: as they all readily pass the Occam's Razor test. Maybe Boeing's reasons span more than one of the theories presented? A 'good read' Mr. Hamilton! KC-45 Contract Protest: How Low Will Boeing Go? Geez. Boeing's mobilization of their unions to write Congress is pretty standard fare, but trying to use classified intel from the CIA to subvert the contract award? Man! THAT'S LOW (and desperate). At least one lawmaker, Rep. Todd Tiahrt (R-Kan.), a strong Boeing supporter who was once employed by the Chicago-based company, requested and received the CIA briefing at the beginning of April. The briefing discusses past practices involving a number of different countries and foreign-based companies, including the European Aeronautic Defence and Space Company (EADS), which won the Air Force contract to build new refueling tankers with Northrop Grumman. "Not as specific" as he had hoped? Hey! This guy isn't even trying to distance himself from the dirty deed. Teaser: Still working the 'size' issue with this Goat-rope. I had a friend at Lockheed Martin send me a copy of a briefing Northrop Grumman is circulating on Capitol Hill (must be getting good circulation if it gets to me)that is pretty interesting: lots of yummy numbers to digest. I may post it tomorrow or the next day with commentary. And I don’t blame American Airlines at all: not one whit. Friday, I was in the Ontario (California) Airport Terminal 4 and like Darryl Jenkins, I blame the FAA and the Crack Congressional Crises Squad (akin to the Crack Jewish Suicide Squad). I might even blame Boeing (the manufacturer by default since they hold the MD-80 ‘type certificate’ that came with the purchase of McDonnell Douglas). I’m sitting here typing this post in ONT - eating a too-expensive-even-by-airport-standards hamburger… and waiting optimistically for a flight back to DFW. The ‘crises’ began a long time ago but got rolling big time about the point I got airborne out of DFW on Monday -- and I’d been watching it drag out all week: hoping it would clear up before I had to return today. VERY late last night I checked my AA reservation via laptop and a notice to call 'AA Reservations' popped up. I called them only to find my flight back to DFW was cancelled and they had me booked flying out on Saturday afternoon. As I was speaking with the very nice agent (who also had a relative trapped in Washington DC over this problem) a seat opened up for a flight later today so I took a chance. Will it go? Hope so. I want to know several things. Why were so many of the MD-80s ‘failed’ when the previous wiring work was inspected? AA has an army of qualified A&P mechanics, and a system that supports them. Was the tech data they worked to comply with too vague? Who issued the data: the Manufacturer or the FAA? Who set the compliance urgency? The FAA?- With ‘help’ from Congress? What was the REAL risk of taking time to fix everything while keeping the schedule going, besides close to FRICKIN’ NIL? Why did the asshats in Congress start “harrumphing” and why did FAA bureaucrats start crapping their pants in response? I’ll probably calm down and ‘let it go’ by the I get home and return to more pressing issues, but right now like thousands and thousands of other passengers I want to know the whys and wherefores of this here goat-rope, and I know it has very little to do with American Airlines. I did get home late yesterday, and it’s good to see some questions being raised. MYTH: Boeing claims that its losing bid received the "highest possible mission capability rating in meeting or exceeding key performance parameters." Most important is the undisputed fact that the KC-45 was rated superior in 4 of the 5 major criteria that the Air Force reviewed and tied in the 5th. Northrop Grumman's tanker is, without question, more capable. MYTH: Boeing claims greater "survivability." FACT: Evaluating against 200 requirements, the Air Force found no survivability weaknesses with the KC-45, but did find unique strengths. Moreover, Boeing is correct that the self-protection system that would be aboard its KC-767, the Large Aircraft Infrared Countermeasures (LAIRCM) system, is the best the industry has to offer. We know this because LAIRCM is a Northrop Grumman product that will also be aboard the KC-45. MYTH: Boeing claims better aerial refueling capability. FACT: While Boeing's refueling capability did meet or exceed Air Force baseline requirements, the same is true for Northrop Grumman. In fact, the KC-45 was found to be superior to Boeing's offering. MYTH: Boeing claims better fuel offload capability. MYTH: Boeing claims better airlift capability. FACT: The KC-767 is, in fact, 69 percent more capable than the soon to be replaced KC-135. What Boeing fails to state is that the Northrop Grumman KC-45, America's New Tanker, is rated 81 percent more capable by the Air Force. The fact is that Northrop Grumman was selected to provide America's New Tanker by offering a superior product. In its ad, Boeing includes a quote from Air Force Secretary Michael Wynne but Boeing fails to include his most important quote. In referencing the Boeing protest before the GAO, Secretary Wynne predicted that the GAO review "will conclude with the fact that the Air Force, in this case, did it right." Maybe Boeing Needs to Crank Out a Few More Revisions to the Protest? He addressed other key acquisition issues, too. Speaking of the need to recapitalize, he said, "It's mandatory, so I'm he optimistic." If the Air Force doesn't stay on track, it will simply age out the fleet. "At some point in time, we simply have to recapitalize," Secretary Wynne said. He also touched on the recent decision to award the KC-45 tanker contract to a consortium co-led by European-based EADS Corp. and U.S.-based Northrop Grumman. He acknowledged that some have been critical of the decision, but he believes that criticism is unfounded. " It's the law," he said flatly, noting that the Air Force could not have restricted the competition if it had wanted to. He also reiterated that the competition was "free, open and above-board," saying that the Air Force made the right decision in terms of overall warfighter value. He also said he believes the Government Accountability Office, now conducting a review based on a protest by losing bidder Boeing, "will conclude with the fact that the Air Force, in this case, did it right." Opening competition to allied-nation corporations is neither new nor unusual, citing several examples of international participation in the U.S. defense industrial base, the secretary said. "The [p]residential helicopter was won by an Italian design. The Navy helicopter was won by an international design. So this is not unique," he said. Not as exciting as a Boeing Program Manager insisting the AF gamed the results without being able to explain the motive is it? But it is FAR (no pun intended) more believable. KC-45 Protest: NPR asked McGraw Hard Questions?! "The Air Force manipulated the cost data," McGraw said when asked what complaints he has about the Air Force's evaluation. "What motivation would the Air Force have to falsify the intelligence, so to speak, about which plane was better," Inskeep asked. "They artificially inflated our numbers," McGraw responded. "When you say the Air Force manipulated, the implication of that word is they didn't just have a disagreement with you, they went out of their way to fake this. What motivation would they have to do that," Inskeep asked. "What they do is called 'risk you up'," McGraw said. "If they don't accept your numbers they will add to it. What they did is they kept risking us up to make our numbers higher," McGraw said. "I don't know," McGraw admitted. "We think we were not treated fairly." "I'd like to know why you suspect that would happen," Inskeep asked. "Why would they be motivated to deliberately distort their findings?" Some of interchange in the 'blah blah blah' is in some ways even more negative. McGraw trots out the 'commercial pricing rejection' issue again (Which I slapped around here). McGraw never really answers the question of "why" except to postulate that somebody on the Acquisition team 'became enamored' by the NG offer, or the AF was 'overly impressed' by the NG lower development costs. Interesting. Boeing's complaint seems to always comes down to how they were graded. Remember how your kids used to think you 'were so unfair' and 'didn't understand' them? That's what McGraw sounds like to me. I didn't buy it from my kids either. I made a comment to a news story (Boeing Lays Out Case For Tanker) at a Kansas televison station website here yesterday. Boeing "claims", Boeing bagman Tiahrt regurgitates it as 'fact', and so it must actually 'be' eh? I'll listen to Boeing's claims when they stop cherry-picking factoids out of context. Want an example? Let's pick "Survivability" then. Would Boeing's claimed advantage be 'overall' or for any particular part or parts of the kill chain? Perhaps the KC767 is negligibly harder to detect on radar? Perhaps it was judged as being able to take 1 more cannon round in the end game? How important is that factor anyway in the overall scheme of things? Had a tanker shot down lately? Does the 'analysis' assume equal exposure to threats, even though the NG KC-45 can fly useful refueling orbits farther away from the threats? Who in the public realm knows? Answer: nobody. Without proper CONTEXT, Boeing's claims are nothing more than marketing and salesmanship. Interesting that they did not use it (factually loaded and confrontational), yet there are now four 'local' (half anti-NG and/or pro-Boeing) comments below the article. I'm shocked. they need to play to the larger market on the web. One thing I HAVE noticed about Seattle and Wichita media comments from viewers/readers: Boeing gets higher negative responses where they live than in the Nation overall. Should that be telling us something? Boeing is trying to make a lot of hay in their ‘serial-protests’ about the AF 'improperly' crediting capability to the KC-45 that comes from its ‘larger’ size. The AF even got called in to testify about it this week by Boeing's Bagmen, and Former Spook did a good 'quick and dirty' post on the 'show'. Boeing alleges that there was supposed to be no credit for exceeding key performance parameter (KPP) objectives and therefore the extra capability that comes from the KC-45 should not have been a factor in the scoring. Are they correct? In a word: NO! 2.2.1 Subfactor 1: Key System Requirements Within this subfactor the Government will evaluate the proposal to determine that the offeror understands and has substantiated the ability to meet the requirements delineated in the SRD, except for the logistics requirements addressed in the Product Support section (Subfactor 3). All commitments to address at some level, meet, or exceed SRD requirements must be specifically reflected in the offeror's proposed system and aircraft specifications. because it cuts the legs off their case…] If there is no stated objective and, depending on substantiating rationale, positive consideration will be provided when the specified capability above the KPP threshold is viewed as advantageous to the Government. b.All SRD requirements in paragraphs 2.2.1.2a through 2.2.1.2e below that are notKPP thresholds are desired, but are considered part of the offeror's design trade space. For non-KPP requirements, the Government may give consideration for alternate proposed solutions or capabilities below the stated SRD requirement, depending on substantiating rationale. The Government may give additional consideration if the offeror proposes to meet (or exceed if there is an objective) the SRD threshold or requirement, depending on substantiating rationale. c. Within each of the paragraphs, 2.2.1.2a through 2.2.1.2e below, evaluation of the offeror's proposed capabilities and approaches against the SRD requirements will be made in the following descending order of relative importance: KPPs, KSAs, and all other non-KPP/KSA requirements. d. For paragraph 2.2.1.2 e below, a collective assessment will be made for all the related SRD requirements therein. a. Aerial Refueling: The Government will evaluate the offeror's approach to meeting requirements related to aerial refueling. This evaluation will include: tanker aerial refueling, receiver aerial refueling, fuel offload versus radius range, drogue refueling systems (including simultaneous multipoint refueling), the operationally effective size of the boom envelope, the aerial refueling operator station and aircraft fuel efficiency. b. Airlift: The Government will evaluate the offeror's approach to meeting requirements related to airlift capability. This evaluation will include: airlift efficiency, cargo, passengers, aero-medical evacuation, ground turn time, and cargo bay re-configuration. The offeror's airlift efficiency will be normalized against the KC-135R airlift efficiency calculated with the same ground rules. An offeror's airlift efficiency value greater than 1.0 will be viewed as advantageous to the Government. c. Operational Utility: This evaluation will consist of an assessment of the contractor's approach to meeting the requirements relating to operational utility, including the following: aircraft maneuverability, worldwide airspace operations, communication/information systems (including Net-Ready capability), treaty compliance support, formation flight, intercontinental range, 7,000 foot runway operations, bare base airfield operations, and growth provisions for upgrades. d. Survivability: This evaluation will consist of an assessment of the contractor's approach to meeting the requirements relating to survivability, including the following: situational awareness, defensive systems against threats, chemical/biological capability, EMP protection, fuel tank fire/explosion protection, and night vision capability. e. Other system requirements: The Government will evaluate the proposed approach to address all SRD requirements not in a, b, c or d above or in Subfactor 3. Boeing’s argument that the advantage in KC-45 capability should not be counted is specious. I have to believe they know it is specious, since the information showing it to be false begins in the very next sentence after their protest ‘hook’. So now we have eliminated the ‘size’ issue from the capability grading standpoint. Next we start talking relative sizing. Homework reading assignment: how do airlines around the world view the A330 airframe vis a vis B767? Are they 'really' THAT different? This is a general reference post that will provide a link that I'm going to send to every moron out there that thinks Eisenhower's oft-cited quote still applies and who then throws it out as a general purpose anti-defense spending rationale. I actually prepared this a while back for a friend at work who begrudges the oil companies their profit. Every time the quarterly earnings come out we get treated to the despair over the oil company profits by our more Socialist leadership 'leaders'. Did you ever wonder why 'oil profits' are never presented in any context, but always in raw numbers without any frame of reference? I made the chart below just for those out there who can't grasp just how big 'big oil' is. 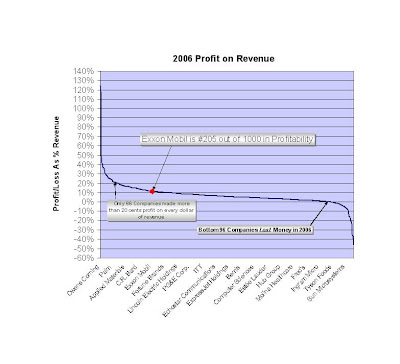 This is a graphic view of the 2006 profitability of the 2007 Fortune 1000 companies. That's right: Exxon Mobile is only a 'mid-performing company, making about 11 cents profit off every dollar it takes in. It's just a freaking HUGE mid-performing company. Now all we have to do is get Congress to stop pandering to the Enviros and the rest of the far left, and we can lower prices at the pump AND improve the bottom line for Exxon etal. Ah! Another ‘redacted’ summary is out? Mmmmmmmm. Must get one. "We continue to update and expand our protest," McGraw said during an April 3 teleconference in which he walked reporters through a 13-page redacted summary of the updated protest. "As the team discovers things, they're going back and adding to the supplemental protests." He said some of the protest points are being expanded and clarified as more information from Northrop's proposal and the Air Force's decision-making process is revealed to Boeing's protest team. In the additional documents, Boeing continues to argue that the air service's concerns about boom safety and maturity and "Northrop's very complex build plan" and "risky" schedule should have lowered their competitor's score further than it actually did. Boeing also argues that costs were not accurately compared. "It seems like a lot of our commercial data was not accepted, our fixed-price data was not accepted as fixed," McGraw said. But Northrop's data was more readily accepted in spite of "grossly understated" military construction costs, he said. "In general, there seems to be a significant leveling of costs at the 11th hour." I smacked Boeing down on the heart their ‘commercial cost’ claim in the original summary here. This is not to say that Boeing won’t find a sympathetic ear someplace because the FAR DOES allow the contracting official some leeway in determining if something Is ‘commercial’ or modified to the point that DoD-grade cost/price data is necessary. Some second-rate, second-guesser COULD disagree with the responsible acquisition official, but in a proper review that wouldn’t be enough to uphold the protest. Boeing is ‘piling-on’ in the hopes of getting enough ‘second-guessing’ going to provide their helpmates in Congress do that voodoo that they ‘doo’ (not a typo). Now, the 'learning curve' disagreement has to do with mandating credibility. Can Boeing DEMAND its Customer believe their numbers? Is it Boeing's position that the Customer's analysis CAN'T be right? In reality, all that is important to the legality and propriety of the contract award is that the AF has a reason for not believing the 'learning curve' number or believing in their own estimation more. The O&S costs claim is probably the most overtly specious argument Boeing makes in the original protest summary. It is quite common knowledge in the logistics field that the most important support driver of any aircraft weapon system is HOW it is used. Boeing's insistence that Delta Tech Ops has more insight into Tanker O&S costs than that provided by the fleet of KC-135Rs is ludicrous. As old as the Rs are, their avionics and propulsion systems are closer to the age and technology of the 767 design than Boeing would like to acknowledge. Since avionics and engines are typically the major cost drivers on non-LO aircraft, I would prefer using KC-135R data over a predicted 767 extrapolation from civilian operations as well. The only part of the KC-135R supportability that probably wouldn't translate easily is the heavy structures contribution: something the AF should be able to factor for quite easily from their own experience. It is really hard to tell if this complaint is just 'piling on' or actually a manifestation of Boeing's hubris. Which means absolutely nothing without the weighting factors for each area, difficulty or ease in improving (risk) in each area, OR relative scores in each area. For example, the 5 NG so called ‘Weaknesses’ could have been in the least important requirement in 5 different sections and each might require very little effort to change or correct. 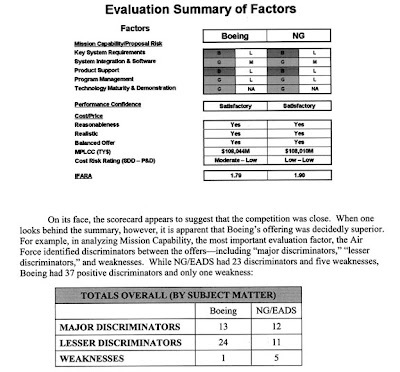 The 13 Boeing ‘Major Discriminators’ could have been for the 13 least important factors and NGs 12 ‘Major Discriminators’ could have been the top 12 weighted factors. The ‘lessor [sic] discriminators’ for each contractor could have all been very close to each other for each line item. Now did it happen exactly that way? Probably not. But it happened close enough to this way for the AF to select NG for the contract. Boeing doesn’t like their score. Boo Hoo. Help them Congress(not)! When I get to Part III, I want to get past the ‘grading’ issue and get on to the ‘size’ issue because I’m getting really tired of Boeing’s misrepresentation of how the candidates match up, including the one Boeing didn’t even bid, but keeps talking about: the B777. KC-45 Protest: Boeing Backing Off? "denied motions filed by Northrop Grumman Corporation (NOC) and the United States Air Force calling for a partial dismissal of Boeing Corporation's protest of the Air Force decision in the KC-45 Tanker acquisition process." "The denials came after a supplemental filing by Boeing Corporation that streamlined its original protest and eliminated many of the elements that were central to the Air Force and Northrop Grumman motions"
Update: Well, NOW Boeing claims it DIDN'T 'narrow' the protest. Riiight.